Most Second Life residents have seen scripted animated gif images of dancing mice or frogs and the such like, and whilst they serve their purpose they can be of poor quality and can cause lag. There is another way however of creating animated gifs for Second Life that bypasses the lag issue, and that is to use media on a prim. In this tutorial I will show how to create an animated gif using Gimp and how to add the animation to a prim. Before creating a gif animation you will need a short video to convert into a series of images that can be loaded into Gimp. The process of turning the video into a series of images will need movie editing software, but if you have made the video yourself you probably already have software you can use. Because I wanted to create a series of arty animated gifs I used software called Whorled which is freeware. Whorled was designed to create animated sacred geometry images but it works very well, at least for my purposes. 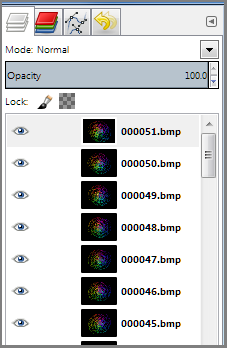 It also contains the options of saving the animations as avi files or to save each frame as a bitmap. Once you have converted the video into a series of images they can be loaded into Gimp. 1/ Start up Gimp and then select File > Open as Layers. Browse to the folder containing the converted video images and select the first. Scroll down to the last image and holding down Shift click the last one. All the images should now be selected. Click Open. All the images should now load into Gimp, which may take a while. 3/ A window similar to the above will open, and you will need to make the same selections that are shown here. Click Export. 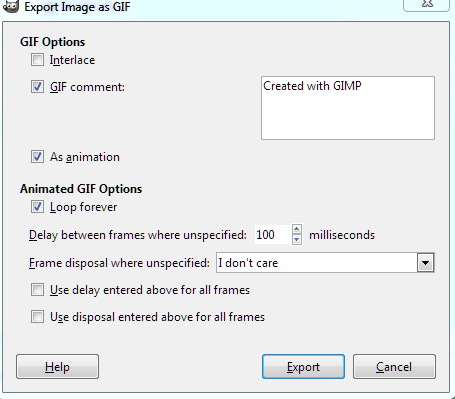 Don't worry if Gimp seems to hang at this point because it might take a while for it to create the gif file. Finally, you will have your animated gif file. 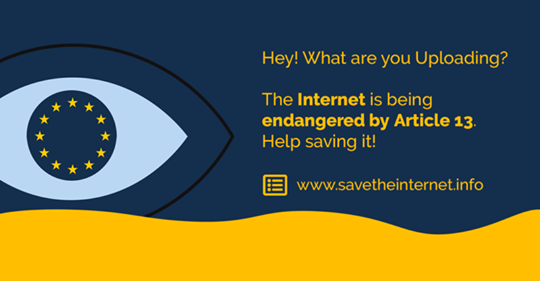 Before showing the animated gif in Second Life you will need to find a reliable web host to upload it to. For my animated gifs I uploaded them to Blogger. Once the gif file has been uploaded, view the page then right click on the image to copy its url. Now click on Copy Image Location from the drop down menu. You will later need to add this to a prim in Second Life. 1/ Start up your Second Life viewer and go to a place where you can build. Rez a cube prim and resize it to your liking. 2/ Go back into edit, and in the edit pane click on Select Face then click on one side of the prim. 3/ Under the Texture Tab click on the dropdown tab which should either show as Materials or Media. You need to have the Media option selected (highlighted in red above). 4/ Under the Media tab select Choose and another window will open. At the top of this window paste the url of the gif image, then click Apply and OK. Your animated gif should now appear on the face of the prim. 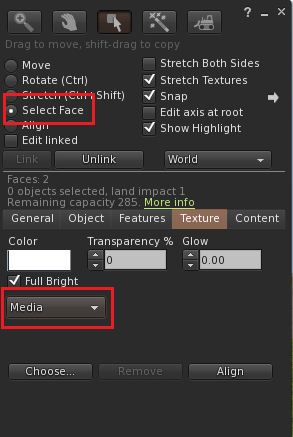 You may find the gif image only takes up part of the prim face, but you can change this by altering the horizontal and vertical scales under the Texture tab in the edit pane. A scale of 0.4 worked well for me. You may also need to adjust the vertical and horizontal offset, again under the Texture tab. 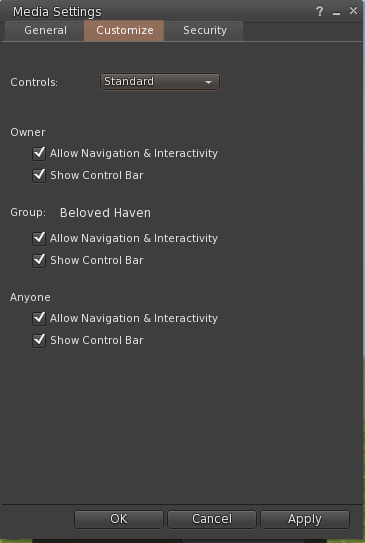 If you want to hide the Control Bar and disable navigation and interactivity (which I think looks more professional) you can do this under the Customize tab in the Media Settings window. 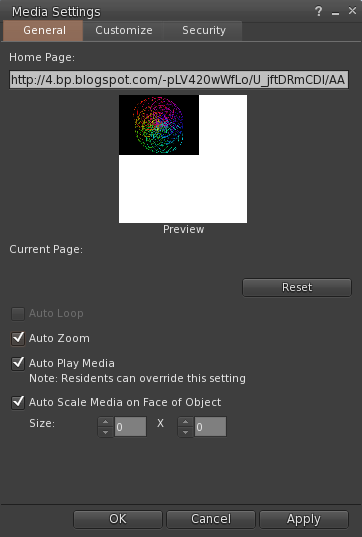 This is all there is to adding an animated gif to a face of a prim in Second Life. You will find this method causes much less lag than the scripted method, although it may take a second or two for the gif to appear. Residents will also need to use a viewer that enables media on a prim, and have the option activated. Creating animated gifs isn't just about having a dancing mouse in your in-word store window, but it is an art form in its own right. Its an area where you can let your imagination run freely and just to prove it Google animated gifs and you will find plenty of fantastic examples. You can see more of my animated gifs on my other blog Lusus-art.